A friend and client asked me to come up with a mood board for her basement living room. 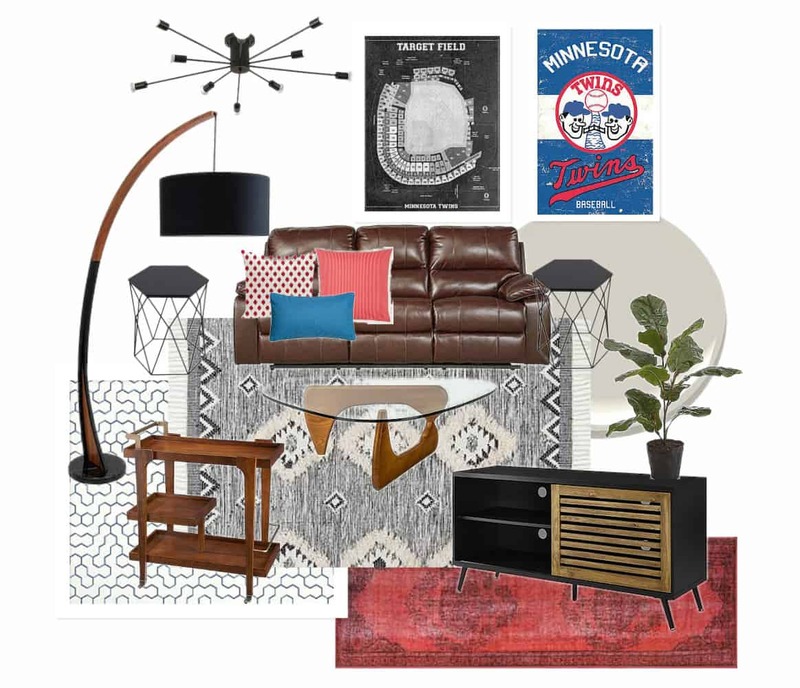 We decided on a vintage modern sports living room…. 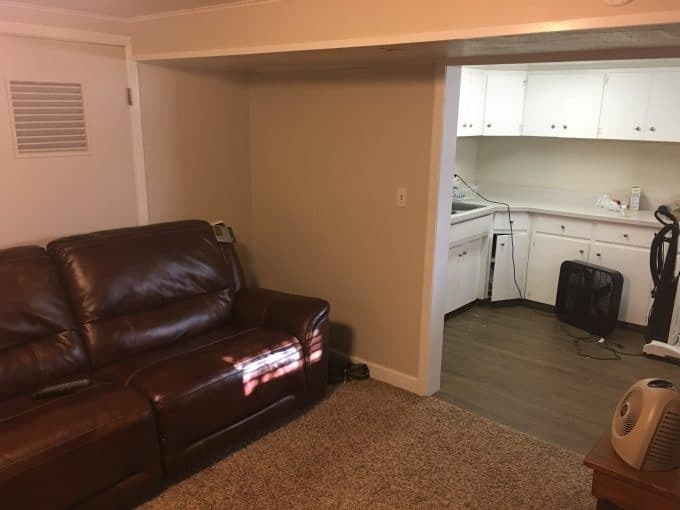 the “not man cave”. Basically they wanted a sports themed room where EVERYONE could hang out. She loves a vintage vibe, but wants the room to feel modern. Here is the mood board that I came up with for her, with some notes about how to make it all come together. Layout: As for the layout, I think this drawing is the best option. 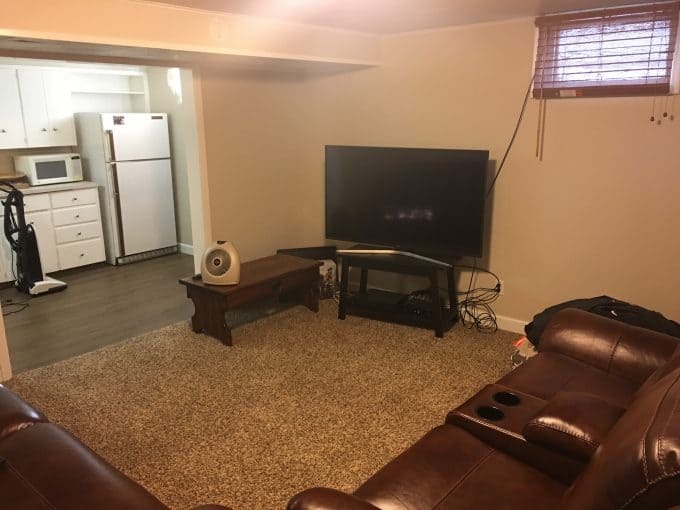 Although it would require running the cable around the room, it will open up the doorway to the furnace room, and utilize the 58″ wall for the tv stand and pivoting wall mount. 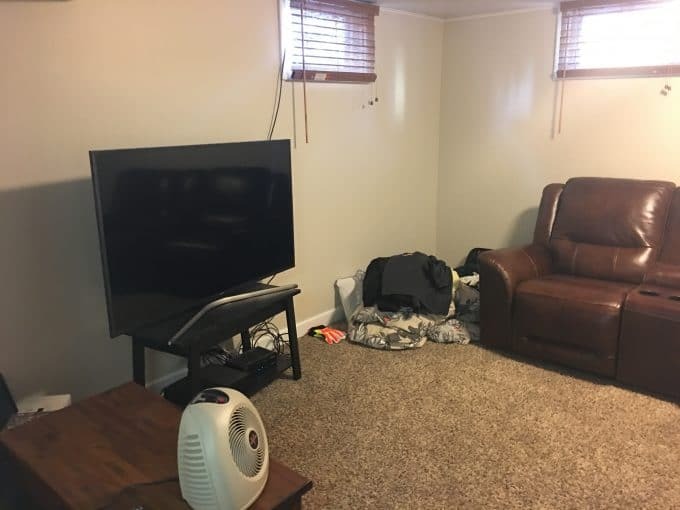 If you’re not comfortable wall mounting the tv I know there are a lot of places that will do it. Then when the tv is not in use you can swivel it back against the 58″ wall centered. 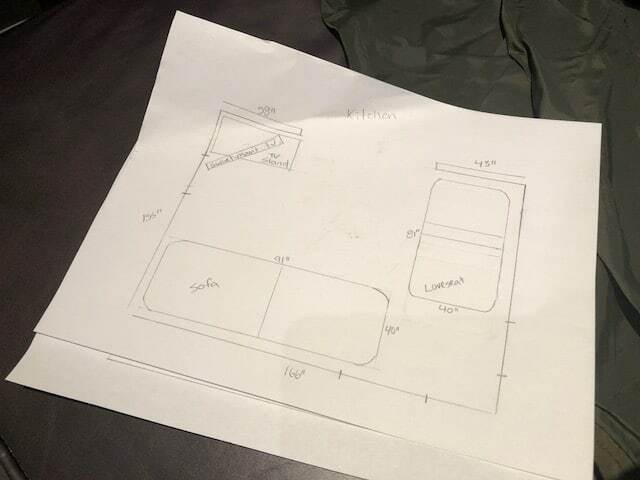 This layout should also allow extra room for both sofas to recline. TV Stand– For the TV Stand I think you should stick to a 52″ piece to use most of the wall, and to still be wider than the tv. This one was my top choice, but here are two other good options, in white or in wood. Coffee Table– Because you have recliners, you don’t need a piece you can put your feet on, but rather a spot for drinks, books, or snacks. I love this acrylic coffee table. Here’s an example of one in my friend’s living room. I like that it visually doesn’t take up any space. Otherwise I also love this coffee table which is cool and modern. Kitchen– I love the idea of a bar cart against the 43″ wall, I really like this one, but there’s tons of cool ones out there. If you wanted to add a bright pop of color to the kitchen, this peel and stick wallpaper would make a fun backsplash and it’s really simple to install! I also think a runner would add a lot of life in here. I love this one, but you could find lots of great ones out there. Lighting– For the corner near the windows a floor lamp would be great. The floor lamp that I love is this one, but it would be a splurge, otherwise I think this one or this one would look nice too. I’m not sure if you’re wanting to swap out the fixture, but I think this one would look great. 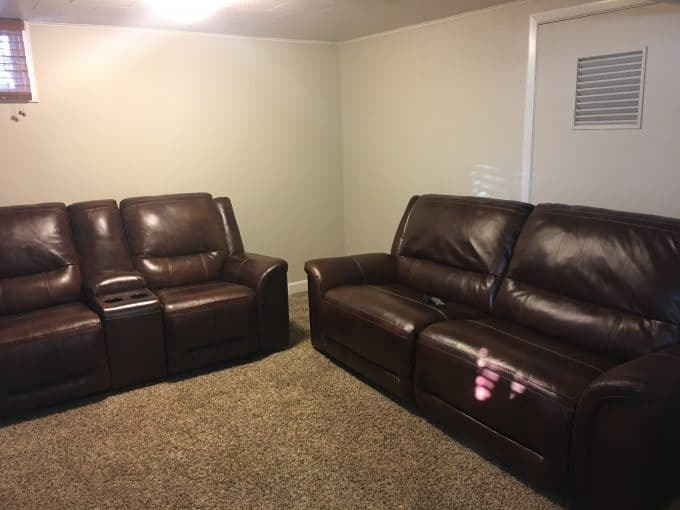 End Tables– I think you’ll have room for one in the corner and one between the sofa and wall, but I’d move the furniture and check first. I love this one or this one equally, but I like that they’re both visually light compared to the heavy sofa. I’d probably go with two of the same ones. Pillows and Throw Blanket– Red Throw Pillows * Blue Throw Pillow * Red Throw Pillow * Throw Blanket– I’d use about 2-4 pillows per sofa, and 1-2 throw blankets draped over the back or arms of the sofas. Rug– I’d get as big of a rug that will fit with both the front of the sofa and the front of the love seat on top of it…. I’m guessing 8×10 but maybe even 9×12. Here are a few of my favorites: Geometric, Moroccan, Western. Windows– I’d take down the current blinds and swap them out for either white ones or none at all. My favorite place to buy from is Blindster.com. Pennants– Above one of the couches, I’d hang 3-4 pendants, vintage if you can find them! I think they’d look really nice if you framed them in frames like this. There’s lots of cool vintage ones on Etsy, just be sure not to buy a mini-pennant! Art– Another option would be to get this vintage looking MN Twins flag and frame it and hang it over the couch, or this print or this one. I also love the look of these ballpark blueprints or hockey stadium blueprints. Shelves– I love the shelves you found, and think they’d look awesome above the 43″ wall. Otherwise possibly on a kitchen wall or next to the furnace room door near the couch. Finally… I’d find a way to bring in some greenery. It always gives life to a room. Possibly this faux fiddle leaf plant, or even this faux tree. Otherwise on the shelves, or a plant on the end table. If you’re interested in a mood board, check out my e-design services here!